Nearly a third of children aged 10-11 years in England are either overweight or obese. 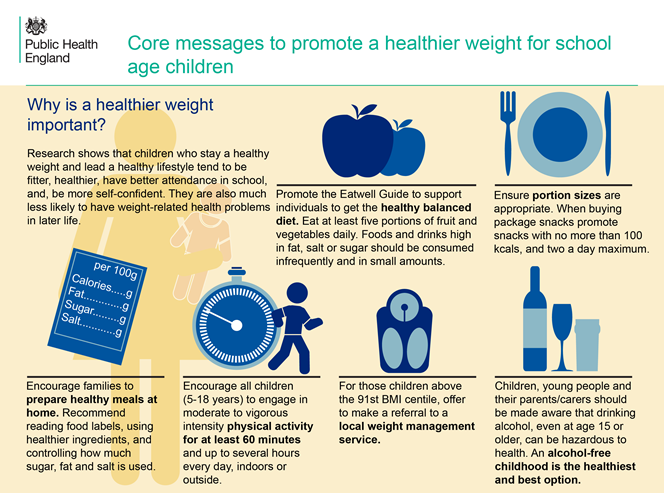 Health and care professionals are in a unique position to enable children, young people and families to make positive food choices to achieve a healthier weight. It is clear that obesity and its associated health risks should be raised with families in a sensitive, open and empathetic manner. One of the key challenges health and care professionals face is keeping up to date with evidence-based messages. We have spoken to a range of health and care professionals who have requested simple, evidence-based guidelines and training through various formats to support them to raise the topic of a healthier weight sensitively at opportunistic times. And so Public Health England (PHE) has developed a suite of resources to support health and care professionals. 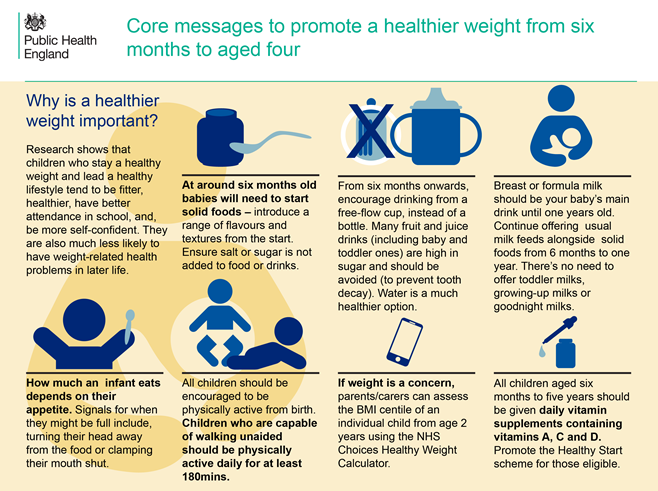 Each resource uses different formats to bring together the latest key evidence-based healthier weight messages for specific age or target groups. Six engaging infographics which professionals can use in practice to deliver core messages. Each of the six focuses on a different age group: preconception; during pregnancy; birth to six months; six months to aged four; school aged children (five to aged eighteen) and parents and carers. Obesity is a complex problem and there is no single solution. Tackling and preventing childhood obesity involves a broad range of actions involving stakeholders from across the system. Whilst health and care professionals are the key audience for these resources, they can be utilised by the wider public health workforce. Can you use these tools to help families in your area? Please contact me for further information.